Protective eyewear has been part of the driving experience since the dawn of the automotive era. We've all seen photos of early 20th century drivers in open carriage cars wearing goggles to block dust and other road debris from getting into their eyes. Today, photoprotective eyewear—sunwear —is essential for safe, comfortable driving. In general, driving lenses should improve contrast and relax the eye muscles to reduce stress while driving. When selecting sunglasses for driving, there are a number of features to look for. Polarized lenses are a must for drivers to reduce the debilitating glare effects of reflected light and to reduce eyestrain and fatigue. Whether glare reflections originate off window glass, the dashboard, the hood, or the road surface, polarized lenses are the ideal solution. By selectively blocking reflections from horizontal surfaces, polarized lenses deliver improved contrast sensitivity and thereby allow drivers to more quickly see a child, bicycle, pedestrian, or car lurking in the shadows of trees or buildings. 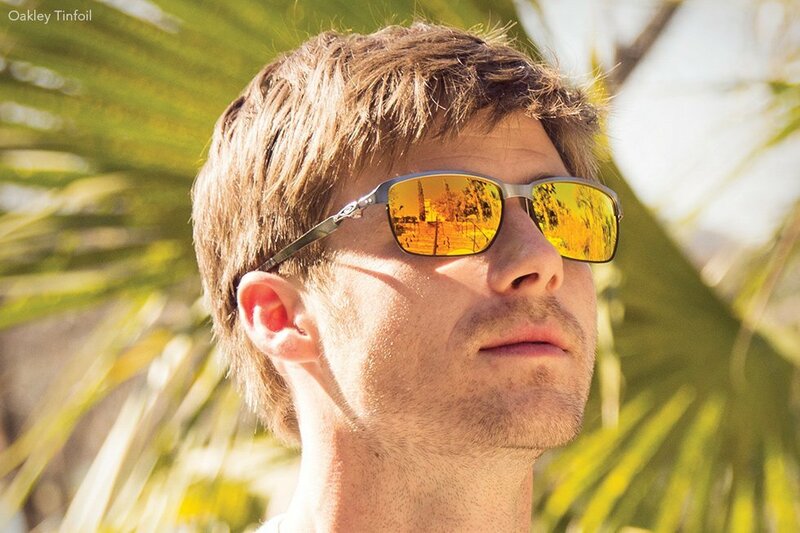 Polarized lenses also enhance colors, depth perception, and acuity. When researching sunglasses, the proper selection of tints and densities should be reviewed and determined. Traditionally, many drivers use gray lenses, which provide the lowest light transmission and are a good choice in the brightest sunlight. However, brown or amber colored lenses increase contrast, enabling drivers to better read the road contours. These lenses also minimize eye strain because they lessen the glare of scattered light from dirty windshields, smog, and haze. In addition, brown/amber lenses allow drivers to wear sunglasses earlier in the day and later in the evening. Yellow lenses can improve contrast and reduce glare, making them an excellent choice for overcast days or for off-road conditions. Melanin increases contrast while maintaining true color perception. Melanin eases eyestrain and fatigue and is good for long hours on the road. Melanin lenses are dark enough for wearing in bright sunlight, but improve contrast enough to see indoors. It is also important to note there are some differences between male and female color vision that will influence their preference of lens hue. In general, most men’s color vision is red-sensitive and often prefer a neutral-transmittance lens such as gray. On the other hand, most women are red-deficient and often find a gray tint "flat" or dull, while a brown-based tint appears to provide more ‘natural’ vision. These gender guidelines are by no means universal. In addition, people will often become accustomed to a particular tint during years of use (visual habit). Demonstrating all the primary and secondary sun tints (rose, for example) is the only way to discover the optimal choices. Some drivers prefer fixed-tint gradient lenses because they block excess light coming through the windshield while still allowing the driver to see the dashboard. In addition to tints, consider backside AR coating, which can reduce distracting reflections for the driver. Transition (photochromic) lenses can be effective in reducing glare. However, most conventional transition lenses are of limited use in driving situations because they are activated by ultraviolet light, which is blocked by a car's roof and window glass. An exception is the Drivewear lens from Younger Optics. Developed in conjunction with Transitions Optical, Drivewear lenses are polarized photochromic lenses that are activated by both UV and visible light. Drivewear lenses can darken in a car, with a response proportional to the brightness levels encountered. Along with their photochromic quality, Drivewear lenses also feature optimized hue-changing qualities that further enhance their glare reduction. Other manufacturers also offer lenses specifically designed for driving. Among the best-known products on the market is the Serengeti Sunglasses Driver lens, an all-weather copper lens designed for driving and general purpose wear. One of the newest entries into the driving lens field is the Lifemade Drive progressive lens from Indo. These lenses are designed to meet presbyopes' visual requirements when driving. According to Indo, the lenses provide for perfect distance vision to see the road clearly, as well as the road signs and any obstacles in the way; and clear intermediate vision to keep an eye on the dashboard without needing to make sudden awkward head movements. The company offers three different versions of the lens: Natural LifeMade Drive, ideal for driving in all light conditions, LifeMade Drive Day, optimized for driving in bright sunlight, and LifeMade Drive Night, to optimize drivers' vision at night. Presbyopic Rx wearers may also benefit from having separate single-vision pairs mounted in a wraparound frame, one for day and one for night. As a driver, how much you can see is of equal importance to how sharply you see. A critical issue surrounding any optimized eyewear/sunwear for driving is field of view (FOV). Most states' DMV vision regulations contain minimum standards for a driver's angular FOV and will restrict deficient candidates even when their central acuity is 20/20. In New York, for example, drivers must possess not less than 140 degrees FOV (monocular or binocular). Although recent fashion trends favor larger eye sizes, it was not long ago that 45mm to 49mm eye sizes were the popular norm for both eyewear and sunwear. As wearers have already discovered, smaller-sized sunglasses deliver inadequate sun protection. But smaller eye sizes also do not allow a truly safe FOV for driving. The traditional solution for sunwear has been to choose larger eye sizes, say 56mm or greater, with a shape difference of 6mm to 9mm. This results in heavier, thicker, and more cumbersome sunwear, and still doesn't provide an optimal experience for non-sun driving eyewear. Finding first acceptance in plano sunwear for sports, we are rapidly entering a paradigm shift in lens-form dispensing. Wraparound eyewear significantly increases the driver's unobstructed FOV, without a need for large "B" lens dimensions and without additional weight and thickness. Wraparound designs work for both sunwear and regular eyewear. Until recently, examination, lens, and frame technology has been based on flatter-form lens curves. (This is because lens production techniques were derived from those first optimized for glass.) Note how most of the latest technology for our popular aspheric lenses is designed to make them flatter and thinner. But these flat lenses are unsuitable for use with newer frames that feature steeper wrap angles (also known as "face-form" angle). Using frame wrap angles of 10 to 25 degrees, along with lens base curves of six to eight diopters, it is finally possible to deliver eyewear that can be truly described as offering a "panoramic" field of view . . . literally, akin to having a prescription ground in your windshield. However, there are new vision considerations that accompany these curved lenses and this is where a paradigm shift occurs. With non-traditional values for vertex distance (nine to 11mm) and pantoscopic lens tilt, an "Rx compensator" program must be used to ensure sharp central acuity and binocular fusion with these wrap angles and curves. There may also be residual issues with peripheral sharpness and that's where a whole new generation of lenses specifically designed for wraparound eyewear come in. Products such as SOLA/Zeiss Spazio, Shamir Attitude, and KBCo's Wrap Solutions offer not only an optimized periphery for wrap eyewear through the use of aspheric and atoric curves, they also possess a lens-form factor that reduces excessive thickness and weight (for minus powers). Eyecare professionals should also be aware that wrap eyewear requires pupillary compensation for the de-centering effects of lens tilt, depending on the degree of wrap angle. Success in wrap eyewear also depends on using a starting Rx that is fully corrected for maximum distance focus. 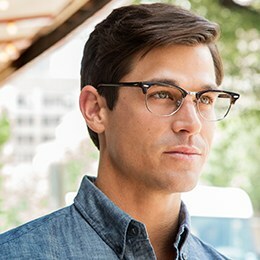 Many wearers enthusiastically receive vision-optimized, wraparound single-vision and progressive eyewear. Although there is an initial perceptual adjustment, they love the improved FOV and the comfortable fit of wrap eyewear. Starting with wraparound sunwear, drivers eagerly desire the same "panoramic" vision for special night-driving eyewear made in the same wraparound form. To wrap it up, there has never been a better time, nor a more receptive audience, for sunwear optimized for driving. -With contributions from Barry Santini, a New York State licensed optician. Related pages and posts: Polarized Sunglasses, Protective Sports Eyewear, Sunglasses & Contacts Go Together, Contact Lenses, Transitions® Lenses, Video: Serengeti Sunglasses Features, Sunglasses with Gradient Lenses.